When an artist explicitly identifies his source material, the audience has the option of listening for those themes or hearing the music purely as music. Steve Coleman’s album concepts tend to be so esoteric they’re usually easy to ignore. 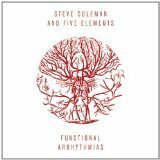 But in exploring the interactions of the heartbeat and other bodily systems on Functional Arrhythmias, he and Five Elements draw you to those themes, simply because the music has such heart. This may be the most openly engaging, generous effort yet by the influential founder of the M-Base movement. The opening song, “Sinews,” sets the tone. First comes Anthony Tidd’s lean, funky bassline, followed by Coleman and trumpeter Jonathan Finlayson’s punchy horn harmonies and incisive solos. Then comes the first of several abrupt stops to reboot the arrangement. Here and throughout the 14-song album, Coleman and the wide-ranging, ever-deepening young Finlayson bask in their long-term partnership with turn-on-a-dime exchanges and congenial overlapping phrases, breaking down the clipped melodies with airy precision. There’s plenty of variety in the attack. On “Chemical Intuition,” a vehicle for unadorned horns, Coleman hints at a Johnny Hodges-like purity while the welcome influence of Ornette Coleman and Henry Threadgill is felt elsewhere. “Medulla-Vagus,” one of five tracks featuring rising star Miles Okazaki on guitar, boasts a dreamy, collage-like opening keyed to his Spanish-style playing, then unfolds over a tuba-like bassline and Latin-style percussion by drummer Sean Rickman. Like Tidd, Rickman is returning to the Elements fold after an extended absence. It’s a functional, rhythmic homecoming, to say the least.